As the only Milwaukee ethnic celebration that operates as a genuine street festival, Bastille Days has been held in the Cathedral Square neighborhood on the East Side every July since 1982. The multi-day festival is inspired by Bastille Day, the French national holiday, which commemorates the storming of the eponymous prison on July 14, 1789, and symbolizes the destruction of France’s Old Regime. 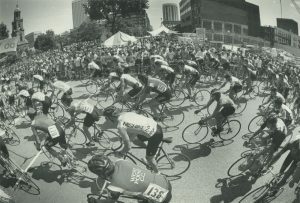 The East Town Association, comprised of downtown businesses, corporations, and residents, sponsors the festival, which was originally called La Kermesse de la Bastille (The Fair of the Bastille), although patrons generally referred to it as “Bastille Days.” While the festivities in France includes a military parade down the Champs-Élysées, fireworks and other patriotic festivities, Milwaukee’s version, which draws over 200,000 visitors, celebrates the Juneautown neighborhood and its founder, the French-Canadian fur trader, Solomon Juneau, along with, of course, French culture. In lieu of Paris’s military parade, festivalgoers have enjoyed live music, fashion and puppet shows, a 75-kilometer bicycle race, wine tasting, and street performers. As in France, the celebration featured a waiters’ race, in which participants balance beverages while running. In 1985 a new tradition began with the “Storm the Bastille” five kilometer run/walk on Thursday evening. Efforts to re-create the Parisian ambiance led to the addition of a forty-three foot wooden Eiffel Tower in 1993. When safety concerns led organizers to replace the popular meeting spot with an inflatable version in 1999, visitors panned the new faux Eiffel Tower as a tacky substitute. 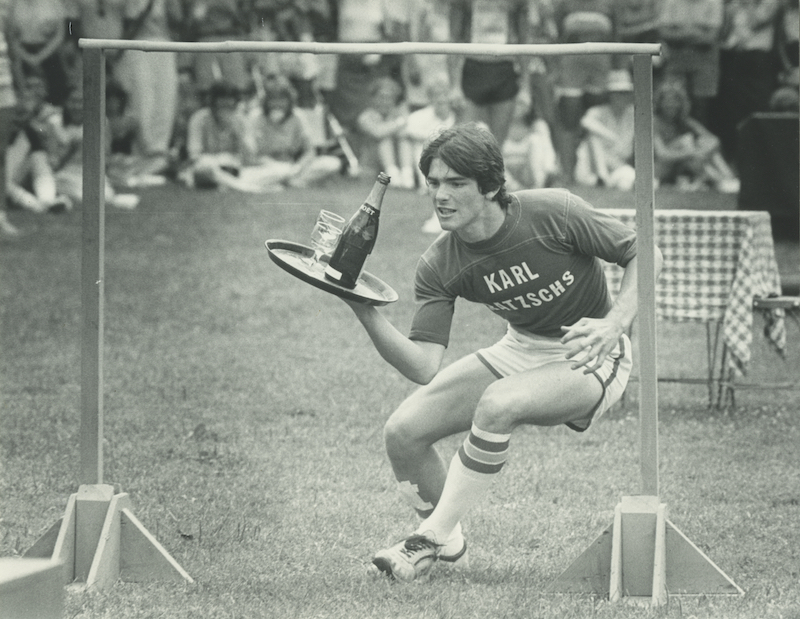 The following year, the Milwaukee School of Engineering overhauled and resurrected the Bastille Days landmark. ^ Easttown, last accessed May 4, 2017. Note that unlike the other ethnic festivals, there is no entrance fee. ^ For a concise overview of the French Revolution, see William Doyle, The French Revolution: A Very Short Introduction (Oxford [U.K.]: Oxford University Press, 2001); see also Bastille Day—14th July, france.fr, http://www.france.fr/en/celebrations-and-festivals/bastille-day-14th-july.html, information now available at Bastille Day, france.fr, last accessed May 4, 2017. The first celebrations in France took place in 1790. ^ “France Comes to Jefferson St.” The Milwaukee Sentinel, July 16, 1982, accessed February 4, 2015, http://news.google.com/newspapers?nid=1368&dat=19820716&id=AnFIAAAAIBAJ&sjid=KhIEAAAAIBAJ&pg=4793,2937963; “This Weekend, Join in Milwaukee’s Own French Toast,” The Milwaukee Sentinel, July 16, 1982, accessed February 10, 2015, http://news.google.com/newspapers?nid=1368&dat=19820716&id=AnFIAAAAIBAJ&sjid=KhIEAAAAIBAJ&pg=3220,2770359; Laura Salsini, “Bastille Fete Merges France, Milwaukee,” The Milwaukee Sentinel, July 19, 1982, accessed February 15, 2015, http://news.google.com/newspapers?nid=1368&dat=19820719&id=BHFIAAAAIBAJ&sjid=KhIEAAAAIBAJ&pg=2182,3314734; Jim Higgins, “France Comes to East Town,” The Milwaukee Sentinel , July 15, 1983, accessed March 1, 2015. American Express co-sponsored the 1982 event. The name La Kermesse de la Bastille was dropped for the 1986 festival. ^ “East Town Association. Inc.,” yelp.com, last accessed May 4, 2017. ^ Angela McManaman, “Inflatable Eiffel,” The Milwaukee Journal Sentinel, July 10, 1999, accessed March 5, 2015, http://news.google.com/newspapers?nid=1683&dat=19990710&id=l6kaAAAAIBAJ&sjid=wC8EAAAAIBAJ&pg=6454,4062394. The wooden tower had been part of a department store perfume display in Minneapolis. ^ Jan Uebelherr, “Festivals 2000: Bastille Days,” The Milwaukee Journal Sentinel July 13, 2000, accessed March 5, 2015, http://news.google.com/newspapers?nid=1683&dat=20000713&id=fzUpAAAAIBAJ&sjid=ry8EAAAAIBAJ&pg=2277,1701679.